This web site is brought to you by the Unique Identification Authority of India (UIDAI). While surfing through this site you will come across directories and links to Government and Private Organizations. The contents of these sites are not to be construed as a responsibility of or an endorsement by the Authority and are owned by the respective organizations which may be contacted for any further information or suggestion. 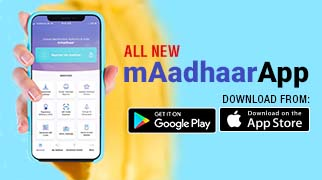 In addition to this website, UIDAI Website Policies are applicable to all other UIDAI portals (Resident Portal, eAadhaar Portal, Aadhaar Update Portal, Aadhaar Dashboard etc.) providing Aadhaar Online Services which are designed, developed and maintained by UIDAI.